And so, eight years after my previous visit, I came back to Wordwell. There is no village here, just the name, which seems to have stepped out of the pages of Finnegans Wake. How Joyce would have loved it. All Saints is a good example of the way in which, as so often in Suffolk, a church was saved from ruination by a reasonably sensitive and articulate restoration. The architect here was the great Samuel Teulon. This church had fallen almost into disuse by the early 19th century, but in the 1850s it was time for it to join the great liturgical movement sweeping the Church of England, and Teulon was called in to preserve as much as was possible, while restoring a sense of catholicity. The first part of the restoration was carried out exactly to his plans. Unfortunately the second part, in the late 1860s, wasn't. Wordwell is predominantly a Norman church, and Teulon, who was more delicate here than at nearby Ampton, retained this sense of antiquity without reinventing it, as happened at Wissington. The sad and laughable 'Norman' pulpit dates from the later restoration, and replaced a Stuart pulpit that had arrived from elsewhere. But despite this the church retains some of the most interesting carvings in Suffolk, in both wood and stone. The first thing you see as you enter the rustic little south porch is a tympanum above the door. This is a flourish of foliage, with two dogs at the base barking. The branches seem to grow from their tails. It is a work of great craftsmanship. But below it to the right, at the capital of the door post, is something more interesting; a primitive carving of a man. He wears a head-dress familiar from those worn by farmworkers in medieval illuminated books of hours. Beside him, a decorative flourish looks as though it was intended to match a facing one. The other capital, however, is bare. It is not likely that the tympanum and capital were executed by the same person, or at the same time. As you enter the door, an even more extraordinary carving faces you in the internal tympanum of the north door. Here, two primitive figures stand. One holds a ring; the other's arms are open wide in surprise, or in a gesture of revelation, perhaps. Some have interpreted this as the story of Edward the Confessor giving his ring to a beggar, who reveals himself as St John the Baptist. If this is the case, than the carving must be pretty much contemporary with the legend, which was popular in England in the 12th century. There is another primitive face on one of the legs of the font, but once you are inside the building it is the woodcarving which will most strike you. There is a mixture of benches in here, and some have been heavily restored. But the armrests are super, with their mythological beasts, and you can see the candle holes in some. Most remarkable is the bench back nearest the door. Here, dragons and creatures with human heads chase and roar at each other, as if illustrating some long-forgotten children's tale. This is a lovely church in a beautiful churchyard, despite its proximity to the horrible Bury to Brandon road. And, I am afraid, it is now redundant, although it is inevitable that some of the churches in this area should fall into disuse. 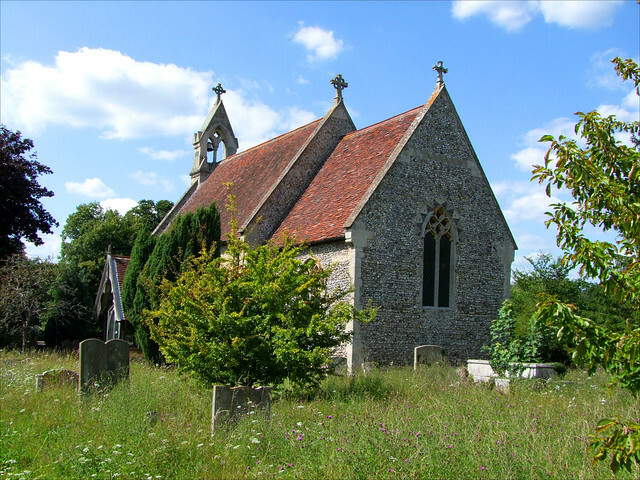 I counted sixteen medieval churches within a five mile radius, and here, on the edge of the Elveden forest, one of the most densely populated areas of England in early Saxon times, the population has fallen dramatically in the last 150 years. The Churches Conservation Trust are excellent custodians, though, and thanks to Mr Teulon, there is much worth conserving.